Over the holiday break, we spent a night at the Frank Lloyd Wright designed Donald C. Duncan House at Polymath Park in Acme, Pennsylvania. We were there to celebrate the thirtieth birthday of one of our good friends and the Duncan House was a fantastic venue to do it. The Duncan House is a prefab house designed for Marshall Erdman and one of the Prefab #1 designs. The Duncan House was originally put in Lisle, Illinois before it was moved to Pennsylvania in 2002. The home was a lot of fun to stay in overnight. All of the furniture was to the period (1950s) including many of the appliances. Unfortunately but quite expectedly, none of them worked (there were modern equivalents tucked away). What I did enjoy about actually staying in the Duncan House was the fact that you could experience the architecture as someone from the period would. When we visited Fallingwater (separate trip), it was fantastic to see such a beautifully designed building and see the great views but you didn’t really get a sense of what it was like to live there. When you stick your bags in the closet or put your toothbrush on the edge of the bathroom sink, you really feel like you’re living there. It might be only for a night or two but you really get an understanding of how you would live in a house designed by Frank Lloyd Wright. That’s a lot of fun. For the birthday we had a catered dinner by Treetops, a restaurant in the resort. The food was delicious, everyone agreed, and Executive Chef Mark Henry did a fantastic job. He even stopped by the Duncan House to say hello (he knew our friend’s brother from when he delivered ice sculptures for them and their family often goes to dinner at Treetops). 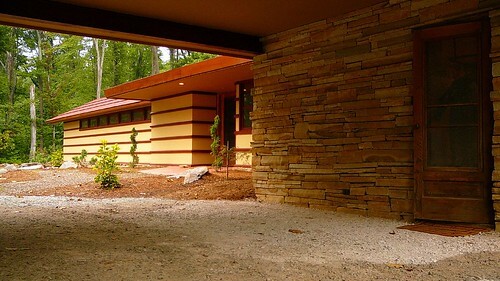 I can imagine a lot of people wanting to check out Fallingwater (40 minutes away) and then continuing the Wright experience with a dinner at Tree Tops and a night at Duncan House (or Balter House or Blum House, which were designed by a Wright apprentice).